The iconic Redhawk® is now available with accuracy-enhancing sleeve and shroud barrels. Barrel sleeves are cold hammer-forged in-house at Ruger and the sleeve and shroud barrel assembly provides for consistently tight tolerance control. 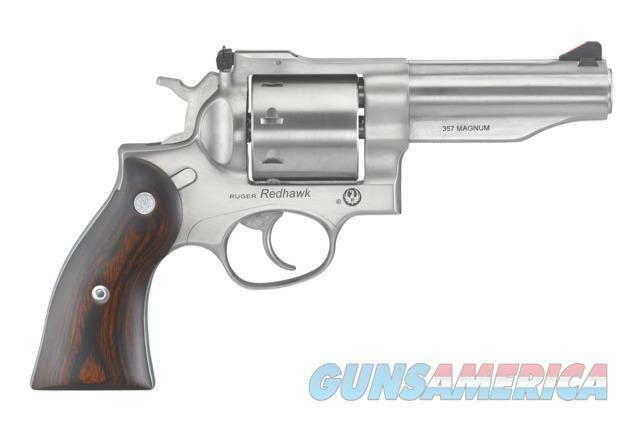 The new Ruger Redhawk .357 Mag revolver model 5059 features a 4.2" barrel, durable stainless steel construction, an un-fluted 8-round cylinder, adjustable sights, and a pair of beautiful hardwood grips. - Cold hammer-forged sleeve and shroud barrel provides outstanding accuracy. - Single-spring mechanism allows for a smooth, light trigger pull. - Triple-locking cylinder is locked into the frame at the front, rear and bottom for more positive alignment and dependable operation shot after shot. - Easy sighting with readily replaceable, colored insert front blade sight and adjustable rear sight with white outline. - Rugged stainless steel construction with no side plates, is designed specifically to handle powerful magnum loads through extra metal in top strap, sidewalls and barrel mounting areas. - Patented transfer bar mechanism provides an unparalleled measure of security against accidental discharge. - Cylinder relieved for full moon clips, three included.